Ok. It has taken me 48 hours, but I admit I watched the latest series of Britain’s Got Talent. It was not my fault. My two kids (10 and 5) wanted to see it and I did not want them to be outcasts at school; the uncool ones that never watch what every else in the country is viewing. The success of the Lost Voice Guy, I think, will have a huge impact on changing the conversation around disability. In fact, in many households it will start the conversation, and probably for the first time. For the one or two of you in this world who do not know, Lost Voice Guy is a disabled comedian, who has never naturally spoken and who uses (like the late Stephen Hawking) a computer to articulate his humorous thoughts. And people voted for him because he was funny. Amanda Holden, one of the judges, put it succinctly: comedians, by definition, have to be edgy. They have to make their audience feel awkward but in a safe way. And they have to connect and make people genuinely laugh. Lost Voice Guy made people feel awkward simply by the way he communicated with that silent pause delay – but with the delay providing comic timing itself. The topics covered were all disability related and pushed the boundaries but always the right side of right. We have seen it before with women and black comedians, but I cannot remember such a distinct mainstream disabled comedian before. And he had a huge level of self-depreciation that was effective, never straying into the painful or sympathetic. And he clearly connected with his audience and proved he was more than a one trick pony. This ‘connection’ is not surprising given there are more than 13 million disabled people in the UK (over 20% of the adult population). Most people will know someone with a disability or at least know someone who knows someone. There is clearly a high degree of resonance with his story. He certainly connected with my kids. Perhaps it was the first time they had seen a disabled person take centre stage on the television. And he told jokes about disabled parking spaces, allocated seats on trains and special people. My 10-year-old can recite most of his lines – to her, he was simply very funny. Perhaps, in a different (and much more subtle way) she saw another side to disability which was not her dad. There will be those who believe Lost Voice Guy has sold disability down the river for five minutes of fame and a laugh. There will be others who say he will never be mainstream until he tells jokes which are not disability related. I disagree on both fronts. 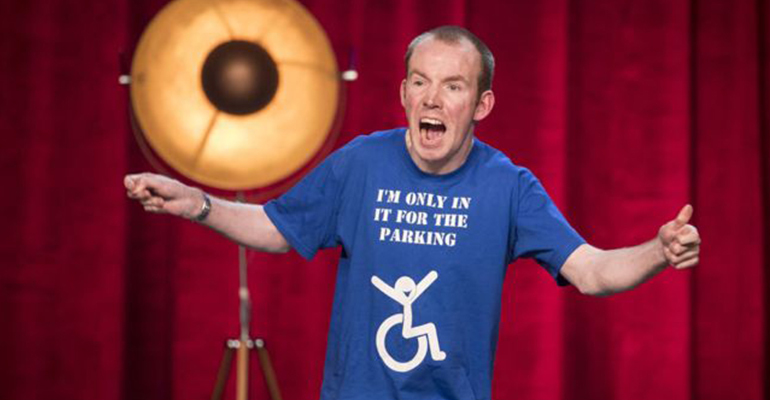 He has brought disability into the homes of 20 million people in a humorous and very positive way. For some people it will change their assumptions forever, which will benefit me tomorrow and the next generation of disabled people. By telling jokes about disability he has reinforced what he stands for and made it even more impactful. Lost Voice Guy should be applauded for what he has achieved. It is no joke to say he really could end up being a catalyst for changing the way people view disabled people. No pressure then! My kids, partner and I look forward to his next performance.